After assembling the worm bin setup, the next thing to do is to find your composting worms. 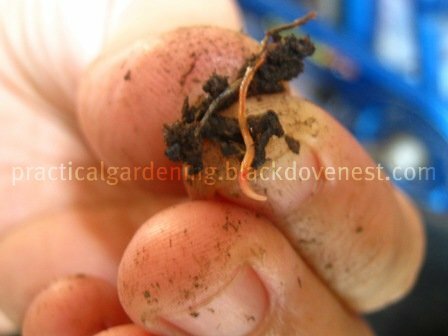 You can buy composting worms in vermiculture centers or from sellers on the internet. Our garden is so rich with composting worms and so we use those instead. They serve the same purpose and are endemic in our region. We also picked a few worms (African Nightcrawlers) in some composting worm beds from a local vermiculture center. 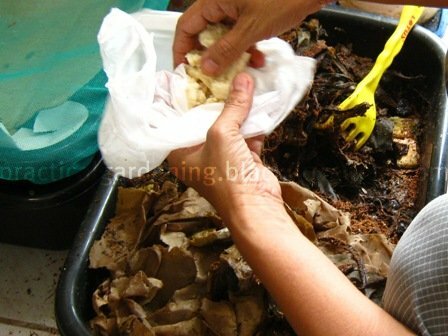 Composting worms would not be feeding on immediately on fresh raw materials like kitchen and yard wastes so it's a good idea to prepare some ready food in the worm bins BEFORE you would actually be putting in the composting worms. Preparing the worm bins with fresh vegetable waste a week in advance would be good. You'd actually need some "browns" and "greens" to feed the worm bins. Browns would include sawdust, newspapers, brown bags, cartons, paper, etc. Although they primarily serve as bedding for the composting worms, the worms would eat these too. Line two sheets of broadsheet newspapers inside the bottom of the feeding tray. With a water sprayer, wet the newspaper sheets inside to keep them moist. Sprinkle some sawdust on top of the wet newspapers and spread it around. Half an inch of sawdust is enough. Put the composting worms on top of the sawdust. If the worms come with some soil in them, put that in as well. Tear up some strips of newspapers and scatter these on top of the sawdust and the worms. In general, most vegetable and kitchen wastes and yard waste like leaves would work. We occasionally get vegetable and fruit wastes from the local market which we get for free. You can also add some broken up pieces of eggshells. 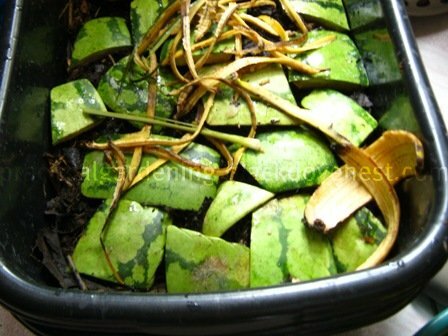 In the pic below, watermelon rinds and banana peels are spread on top of some existing rotting vegetable matter. Although some pieces of cut grass would be okay, a big pile of freshly cut lawn grass would not. A big pile of freshly cut grass would generate heat in the process of decomposition. You've probably felt the warm moist inside of a composting heap of cut lawn grass. The heat generated is enough to kill the composting worms. Raw meat, bones and shells like clams, etc. These would only invite rats and other animals you wouldn't want in your worm bin. 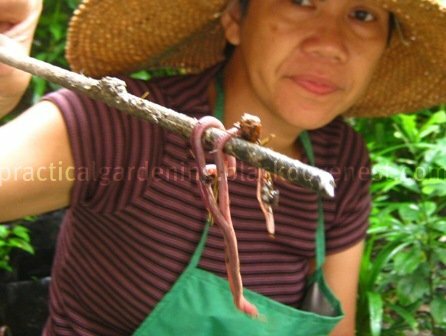 Many vermiculturists swear by soybean pulp (sapal ng tokwa) to produce healthy and fat composting worms that have high reproductive rates. We actually get soybean pulp for free from the local taho vendor. In the photo below, we sprinkle bits of soybean pulp inside the feeding tray. 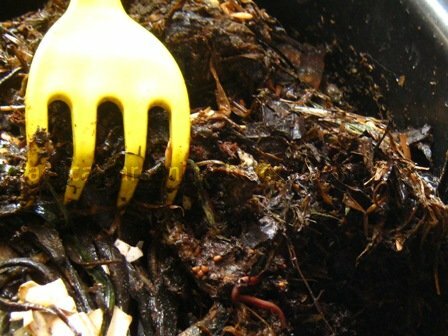 After a few weeks, your composting worms would be laying eggs. You don't need a pair of male and female worms to lay eggs. They can lay eggs individually, on their own. Shown in the photo below (bottom center) are four worm eggs near a composting worm. Eventually, you will get baby worms hatching in your feeding trays and these can quickly grown and reproduce as long as conditions are favorable and there's adequate food. 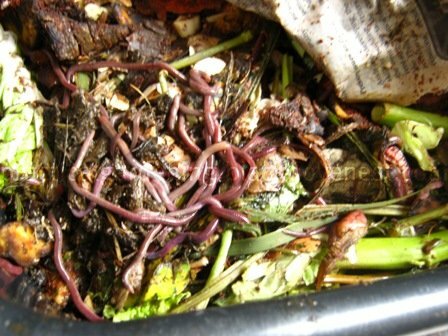 Most vermicomposters recommend a pound of composting worms initially to work in the worm bins. We simply put the composting worms we can get and then add more as we find them. Remember to add some browns to the feeding tray in addition to the food. Here, we sprinkle some more sawdust on top of the decaying vegetable matter. 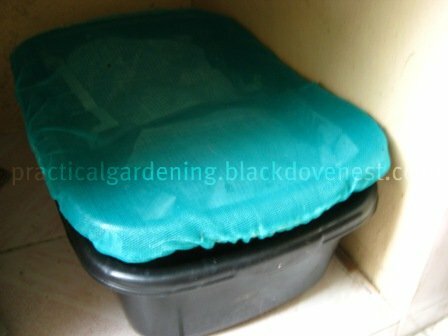 Finally cover the entire material inside the feeding tray with sheets of newspapers before putting the net cover. The sheets of newspapers absorb excess moisture inside the feeding tray. Store the worm bin setup where it is quiet like under a lavatory or sink. Hello, I came across your nice blog. I'm into composting but I'm a newbie. I just put veg scraps into a hole we dug, layer it with soil and so on and so forth. I don't have enough worms. May I know where you buy your worms? I suppose I can keep my holes in the garden instead of under the sink? I'm scared of the worms escaping from the bin. I also have problem with smelly compost so I put more soil. How do I keep it from smelling? It smells some times not all the time. Thanks!!! Hi Corrine. I don't buy my worms. Our composting worms (Perionyx excavatus) are common in the area. We found them plentiful in a big garden pot where we stuffed veggie scraps. I think they managed to get into the pot through the pot's drain hole. They multiply fast. But if you'd rather buy worms, African Nightcrawlers are commercially sold in some garden shows. 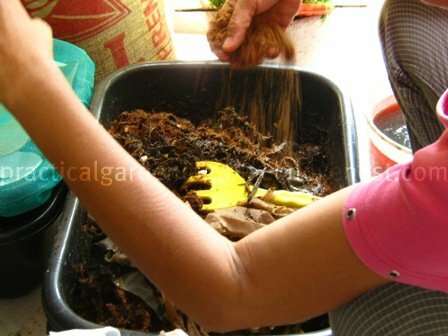 Is it okay to sprinkle coffee grounds to the compost? I don't think it'll hurt to put coffee grounds in compost. Many gardeners just put it directly into the plant soil.